Organum Insolitus: is that a built-in television? If you're a Steampunk virgin: welcome to a world of Victorian era steam power-inspired art where modern technology collides with hammered brass and exposed mechanisms. In other words, the coolest modded gear you will ever see. You can pretty much give any object a Steampunk makeover, but because we really, really love guitars, the following are the shiniest examples of Steampunk axes to grace the earth. Some resonator guitars - particularly the Dobro pictured below - are perfect examples of the latter. Wood body + metal resonator plate = a Steampunk project waiting to be finished! Ok, so the mandolin sways to the lute side of the guitar family, but it's another stringed wonder of the 'Steampunk by mistake' variety. It beats the resonating guitar thanks to its complex-looking tailpiece. This is a Fender US Highway One series Stratocaster so, quite understandably, its owner Jake von Slatt didn't fancy messing with it. Instead, exhibit seven is a guitar with a beautifully-Steampunked scratchplate. Take a brass plate, a "gears, cogs and a flywheel" design and get laser printing. Easy? This unnamed acoustic is probably unplayable. In fact, it looks very much like a wind-up self-playing mechanism - an early robot guitar, perhaps? Regardless, the perfect contrast of golden cogs and worn wood make us want to caress it, whether it's purposefully Steampunked or not. This used to be an Ibanez RG 7-string. The intricate detail of the cogs is remarkable, to say the least. You can see the various arduous stages of the guitars creation on Porkshanks' Flickr stream. The first of two magnificent Thunder Eagle Guitars' creations, this axe (and its name) was inspired by the film 20,000 Leagues Under The Sea. The one-time Dean ML features a submarine-like porthole window which surrounds a sound-activated blue plasma lightning dish. A selection of brass, copper and oak accessories complete the look. Designed and built by Mark Dalzell for the 2008 Jersey City Artists Studio Tour. This beast of a Strat boasts one humbucker controlled by the little red tap, a working patch bay for effects and amplifier connection and a built-in television. Yes, that's right, a television. Unbelievable. Thunder Eagle's Villanizer was born a humble Jackson Randy Rhoads. 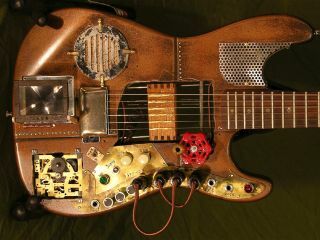 A length of copper pipe, a custom-made oil gauge, handful of intricate gears and a rusty/hammered paint job later and it's the finest example of a Steampunk guitar you will ever, ever see.